In 1979, McDonald’s introduced the Happy Meal. Few people stop and think just how monumental of a marketing strategy this was, but in a time when fast food was just that – food, McDonald’s decided to direct their marketing to the one place where no one expected the restaurant biz to go: kids. Kids by themselves have no disposable income, but the first line of thinking is that their parents do. However, for McDonald’s the plan stretched far further than that. It was a multi generation-long family marketing strategy. After all, in 20 years – bam! – those same kids are now adult consumers, with their own families and their own children. Those children will grow up on Happy Meals, and eventually have kids of their own. And those kids will have kids. The cycle continues. The lesson from this now 40-year strong plan is that marketing to children is worth the investment. The kids of today, “Generation Z” by scientific terms, are an enigma to some and a delight to others. By no means to be categorized with the digital-era Millennial, the currently age 19-and-under Gen Z ’er was born and raised in high technology. It’s your niece who learned to unlock a smartphone before she learned to speak. It’s your kid who doesn’t care for what’s on TV because everything is accessible on his iPad’s Youtube app. The trick to marketing to Generation Z is compression. Your average Generation Z ’er has an 8-second attention span; consider that all the time you’ve got to work with. They’ve been born in a blue ocean of unending information and have somehow developed the ability to filter through it all. Campaigns that feel like traditional ads are ignored; messages that don’t pop only deflate. Your message has to be bite-sized but entertaining, never actually feeling like a call to purchase something or go to your website. TV ads are not 100% dead per se, but you’ll have just as great if not greater success marketing to children online. 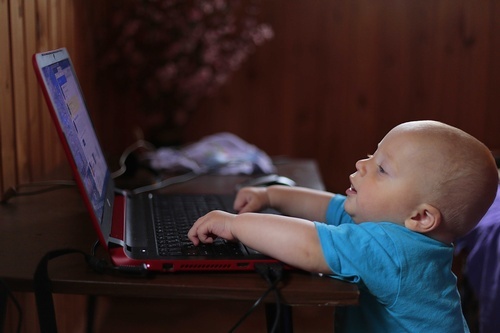 Kids now are not just tech-savvy – they’re tech dependent. Over half of Gen Z ’ers would prefer to buy clothes, books and electronics online. You can also assume most children will have access to a smartphone because even if they don’t currently own one, their parents certainly will. How will you reach them in the period when they’re borrowing their parents’ phones? It could be as a short ad on Youtube, or maybe a sponsored ad for a free video game app. Whichever it is, keep it short, and keep it simple. Facebook was both pioneered by and beloved by the quintessential Millennial. Your younger Generation Z ’er, surprisingly not so much. They prefer privacy and anonymity, perhaps having witnessed the cases where social media has brought the downfall of some bigger personalities in media. Snapchat’s approach using ephemeral content garnered strong success from older Generation Z’ers as a result of this. Younger Generation Z ’s, however, sport a stronger attraction towards Youtube influencers, enjoying the regular content produced by these micro-celebrities. Kids are age-aspirational; they’ll always want to act like their older role models, and while these role models used to be televised actors or singers backed by big brands like Disney, now they’re Youtube vloggers and personalities supported by any sponsor. In this case, you will often find that these Youtube influencers are the cornerstones to marketing to children in the pre-teen to teen ages as they are the ones that these kids look up to and wish to emulate. Generation Z grew up with Google and other search engines the same way you grew up with bottled water. Searching for answers is as natural as breathing for them. Now more than ever, your online reputation is crucial for your business. You need to be on the first few pages of Google just to reach the minimum level of trust with these kids. To do that, keep in mind that the key factor is fresh content. You need to be regularly releasing new content, new videos, and new updates for Google to rank you higher on its priority list. Ad words are nice to get you up there but know that Generation Z ’ers are smart enough to know when they’re being sold something. And never forget about reviews. Be mindful of who’s reviewing your business, and if they gave you a negative comment, respond to it. This shows that your business listens to and considers the feedback given to you by your customers. Growing global concerns for diversity, proper representation, and charity for the unfortunate has inevitably reached the younger generation through online conversation. This generation will be the most tolerant – yet intolerant – one yet. They will be greatly accepting of race and gender, but quickly eschew or scorn racist, sexist, or otherwise biased viewpoints. Media influencers have taught them that a single person can impact the world and make a difference, and these Generation Z ’ers are hungry to do just that. Give them a cause to believe in, and they will go out of their way to support you. Every generation will have a grumble or two about the next one. But like it or love it, they’re growing fast and will make up more and more of the core consumer base with each passing moment. There’s much to be excited for with Generation Z and their incredible aptitude for technology, and with that the limitless marketing possibilities. However, know your target audience and pinpoint what appeals to them, and you could have yourself a jackpot Happy Meal winner too. Thanks to the following sources for some of the information in this article!